After the Boston terrorist attack, in the United States they mobilized public opinion (with media’s participation), they strengthened security measures, and conducted thorough investigations and arrested the guilty. However, at the same time, Washington did not take any serious actions against the threat to the lives of innocent civilians abroad from the part of U.S. drones, and did not punish these culprits. Meanwhile, the international media increasingly began to publish the sad news of the deaths of numerous civilians due to the White House’s increasing use of unmanned aerial vehicles (UAVs) in various countries. More than 4,000 people have been killed in nearly 500 American drone operations in different parts of the world since October 2001, when George W. Bush’s Administration began the first military use of drones. The geographic boundaries of areas of operations have expanded into countries that the United States is not formally at war with. Millions of people on different continents live in fear because of the militaristic policies of Washington and its “American Justice”, perpetrated by U.S. drones, which monitor the entire world and carry deadly weapons. Numerous foreign experts and governments that have suffered from American UAVs, have concluded that their use is not productive, and is leading to a sharp increase of anti-American sentiments, and, as a consequence, to extremism. Most often, the U.S. resorts to the use of UAVs during combat operations in Afghanistan, Pakistan and Yemen. As a result of such attacks, mostly civilians end up getting killed. Thus, according to the Bureau of Investigative Journalism, located in London, just in Pakistan nearly 2,500 people, a third of them – children, were killed due to UAV attacks. In 2013, Yemen suffered mostly from these UAV attacks. Thanks to the efforts of the American military-industrial complex, in recent years, drones have become the most frequently used tool of the U.S. Army during air wars abroad. From 2002 to 2010, the number of UAVs in the U.S. Air Force has increased by more than forty times, and the cost of their production has increased from $284 million in 2000 to $3.3 billion in 2010. According to the Congressional Research Service estimates, made on January 2012, the U.S. Department of Defence has 7,494 UAVs, while general aviation combat aircraft number stands at 10,767. American taxpayers have invested about $11.8 billion into the development of the Reaper Drone. There are some 60 such UAVs in the U.S. Army now, but it is planned to increase their number to 330, and the Pentagon has allocated $1.069 billion in 2012. According to information from the U.S. Federal Aviation Administration, over the next 15 years, more than 20,000 UAVs will be put into operation by the United States, and some 20 years later, their number will already exceed 30,000. At the same time, many countries officially publish statistics on the very low efficiency of the U.S. Army’s UAVs, which, under the declared by Washington “war on terror”, actually become a part of the terror, killing civilians and destroying their homes. Thus, the Bureau of Investigative Journalism notes that 98% of deaths caused by U.S. drones are inflicted on civilians, and so the coefficient of their use accuracy does not exceed 1.5–2%. The government of Pakistan came to the same conclusion, officially stating that, as a result of military UAV attacks in their country, 90% of the total number of victims are civilians. It is very significant that these figures are deliberately hidden by the Pentagon and the CIA, directly carrying out radio control of UAVs over long distances. Instead, the media is provided with false information about the insignificant number of victims among the civilian population. That was the reason, when in late 2011, the London international human rights organization Reprieve, for human rights violations and significant victims among civilians, demanded to bring to justice the officials of the United States, who, by authorizing the attacks of UAVs, violated the Fourth and Fifth Amendments of the U.S. Constitution. The UN High Commissioner for Human Rights, Navanethem Pillay, criticized Washington’s unpunished use of drones abroad and warned of the dangers of the lack of clear legislation, regulating the use of unmanned combat aerial vehicles (UAVs). 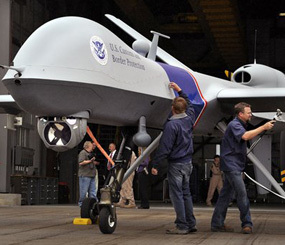 Given the fact that the military’s use abroad of American CIA drones is carried out under the direct command of the U.S. President, numerous public organizations and political figures in the United States demanded that the White House stop the killing of civilians abroad through the use drones. In particular, The National Black Church Initiative, uniting representatives of 15.7 million African-Americans of 34,000 churches in the United States, also demanded this. The representative of the Democratic Party of California in the U.S. Congress, Adam Schiff, demanded transparency and the presentation of a full report on the use of drones abroad and the deaths of civilians. Nevertheless, the White House does not want to listen to the American and international public. Every Tuesday, President Barack Obama meets with national security advisers and identifies new potential targets for American drones in Africa, the Middle East, Asia and even on the American continent. This means that hundreds of civilians and children can become tomorrow’s new victims of Washington’s aggressive policy in different parts of the world. Vladimir Platov, expert on the Middle East, exclusively for the online magazine “New Eastern Outlook”.